Taking time away from your daily routine life for a holiday aboard is something that not everyone can have a chance to do all that easily. However when the opportunity arises for a luxury boat charter vacation, there’s no doubt that it can be a very exciting experience. Among the many tropical destinations on the map, one country that many travelers decide to visit at least once in their lifetime, is Turkey. This culturally diverse country may not be as tropical like other countries south of the equator; however travelers can expect great Mediterranean climate conditions to enjoy a luxury boat charter from Southern Turkey to island hopping in the Greek Aegean. There are many places from the southern coast of Turkey that travelers can embark from. The major ports are Bodrum, a 40 minute drive from the airport; Gocek, a mere 20 minutes from Dalaman airport; Fethiye which is also quite close to the same airport, and Marmaris, otherwise known as gulet heaven and about an hour or so from the Dalaman airport. Where you decide to leave for your journey at sea, will determine your itinerary. If you are looking for a mixture of two cultures, then leaving from the harbors of either Bodrum or Marmaris would be in your favor. 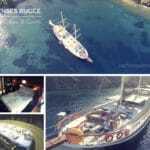 However if you are seeking just a relaxing, or adventurous or both style of boat charter in Turkey, embarking from Fethiye or Gocek might be the route to take. 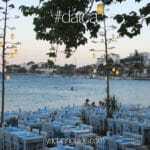 As far as island hopping, then the Bodrum or Marmaris are the advantageous points to start. There are a few options in island hopping from Turkey. You can choose to start from Marmaris and go south all the way to Crete with anchorage points in between to the smaller islands of Greece. 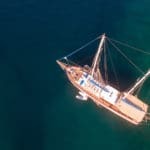 Alternatively you can embark from Bodrum marina and take your boat charter tour to a few islands in the Dodecanese and Cyclades and further to disembark in Athens. Whichever route you decide to choose, they will all be filled with fun and excitement; rich history and much of the culture that each country possesses; and certainly a unique experience in anything else you would like to do along the way. These new experiences could include meeting new people such as other travelers that are anchored in various ports of call, enjoying a night out in a local bar or dancing the night away in an array of night clubs; dining on land at one of the charming waterfront restaurants and possibly shopping around for many delightful souvenirs or trinkets to take back home to your family or friends. Or course we are sure that you might like to choose to do other things as well such as engaging in an assortment of water sports activities too! As for your luxury boat charter, you can pick from a wide selection of Turkish gulets or motor yachts for times that you wish to laze about on board and soak in that magnificent Aegean or Mediterranean sun. Be it your family get-together or group of friends, a private boat charter from Turkey can be high luxury or moderately luxurious can you wish for it to be. 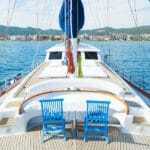 So what are your plans for a luxury boat charter holiday from Southern Turkey? Will you embark to discover the Mediterranean or the Aegean region or both? The choice is yours to think about for your next vacation at sea!